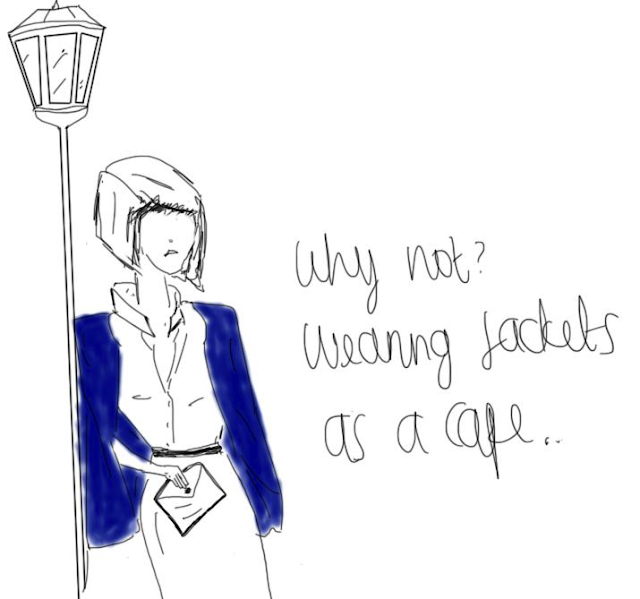 I don´t know you, but I have had some trouble finding the perfect cape... after I saw gorgeous everyone haha using their jackets, coats, parkas.. well everything as capes. I thought hmm What a good idea.. so I have try it every time.. and also is so chic and elegant if you know how to wear them. What do you think about this latest trend. Ps. I decided to start doing some illustrations instead of showing you pictures (which I do not own). What do you think about this illustration thing or should I keep both pictures and illustrations or just one.. tell me what do you think it is so important. No se ustedes pero yo, he tenido ciertos problemas para encontrar una capa perfecta... Despues de que vi a todo el mundo usando sus chaquetas, gabardinas, blazer bueno todooo como capas. ¿Que opinan de esta tendencia? Pd. Decidi empezar a hacer algunas ilustraciones en vez de mostrarles fotos ( las cuales no son mias).